Here is a post duplicated from my other blog, Simply: Home Cooking – it seemed appropriate since so many of the recipes here call from chicken broth! Chicken broth is definitely a staple you’ll want to have on hand if you’re not vegetarian, and yes, there are fairly healthful canned and boxed versions out there; however, the best is (of course!) homemade from scratch. It does take about an hour and a half to cook, but once everything is in the pot, it’s pretty much hands off. Put all the ingredients into a large soup pot, then cover by about 1” with cold water. Immediately reduce to a slow simmer, cover only partially, and let it cook for 1.5 h.
Strain the soup into a clean pot or large bowl, cool to room temperature in a sink full of ice water, then refrigerate in tightly covered containers. The broth will keep up to 2 weeks in the refrigerator. Once the broth has been in the refrigerator long enough to reach about 40ºF, you can place in the freezer in airtight containers. It will keep up to 6 months frozen. What I particularly like about this version is that it can also be made with “recycled” ingredients: in the freezer in 2 large airtight containers labeled “soup bones” and “soup veg” I save the bones from chickens that I cut up for boneless dishes and even bones that have been roasted, too; onion tops, tails, and outer layers; celery bottoms and leaves; carrot peels, tops, and tails; parsley and thyme stems. Food recycling at its finest! If you live near an Asian market, you should be able to find “bamboo beancurd,” a nice change of pace for those into tofu. Here it’s used in a warming soup with cucumbers. Can’t find bamboo beancurd? You can substitute any firm variety of tofu – plain, pressed, or baked – cut into strips or cubes. You can use any type of cucumber for this soup, although if it has a lot of seeds, I recommend scooping them out. Easy to make this vegan if you use veggie broth. Heat the oil in the wok over medium high heat just until it shimmers. Add the scallion and ginger and explode just until fragrant. Add the broth and bring to a boil; reduce to a simmer immediately. Add the cucumber and cook just until it’s tender. This is a great winter comfort food that is quick to assemble but does need some time to cook. Of course, you could make this vegan by leaving out the pork and using a vegetable broth. I made a fun discovery about daikon by mistake (apparently I put the daikon too close to the cold air flow of the fridge): if you’re using it for soup, it can be frozen from its fresh state! (It wouldn’t work too well for other dishes after thawing – too watery.) Thaw it slightly to slip the skin off, then cut as indicated. If you want to add the seaweed, you should look for kelp (scientifically called laminaria, known as haidai in Mandarin) that has been dried in strips. If you don’t have an Asian market nearby, you can alternatively order from the Maine Seaweed Company if you already know you like seaweed. For more information on seaweed, you can visit this page about the medicinal value of seaweed and Michael Guiry’s Seaweed Site, which has a lot of scientific info and great pictures. Place the ribs in the liquid and bring to a boil. Immediately reduce to a simmer and skim any scum from the top of the liquid – if you boil too rapidly, your soup will be cloudy. Simmer for approximately 1 h, or until almost completely tender. In the meantime, peel the daikon and cut it into 1″ thick rounds, then quarter or halve the rounds. If using kelp, wash it, soak it in cool water for 15-30 m, rinse and repeat, rinsing it again before cutting it into 2″ sections. Add the daikon to the soup, and simmer for 30 – 60 m more, adding the kelp about 15 m before pork and daikon are both completely tender. The kelp will help to thicken the soup slightly and give it a smooth, glossy look and feel. Adjust the seasoning, and serve. This is a wonderful winter comfort food that is a snap to put together, although it does need some time to cook. For this dish you should look for kelp (scientifically called laminaria, known as haidai in Mandarin) that has been dried in strips. If you don’t have an Asian market nearby, you can alternatively order from the Maine Seaweed Company if already know you like seaweed. For more information on seaweed, you can visit this page about the medicinal value of seaweed and Michael Guiry’s Seaweed Site, which has a lot of scientific info and great pictures. Place the ribs in the liquid and bring to a boil. Immediately reduce to a simmer and skim any scum from the top of the liquid – if you boil too rapidly, your soup will be cloudy. Simmer for approximately 45 m, or until almost completely tender. In the meantime, wash the kelp, soak it in cool water, then rinse it again before cutting it into 2″ sections. Add the kelp to the soup, and simmer for 30 m more. The kelp will help to thicken the soup slightly and give it a smooth, glossy look and feel. 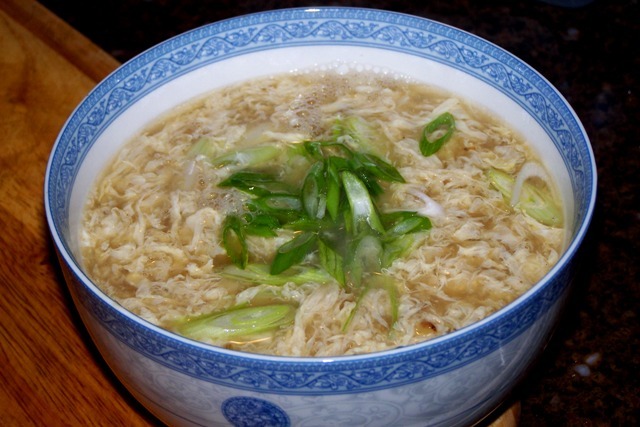 Light, clear, quick and healthful – a perfect soup to accompany a Chinese meal. You can easily make this vegan by using vegetable broth or water. What’s not to like? Separate the stalks of the mustard greens, then soak in cool water, rinse and repeat until no grit remains at the bottom of the sink or bowl. Cut the greens into bite-size pieces and set aside. Cut the carrot into 1/8″ thick slices on the diagonal (or you can get fancy and make carrot flowers by cutting grooves down the length of the carrot, then slicing 1/8″ thick across. Cut the mushroom caps into bite-size pieces, either quarters or halves will usually do. Add the mushrooms and carrots to the broth, and bring back to a boil. Reduce to a simmer and cook for approximately 5 m, or until carrots are almost tender. Add the mustard greens and cook just until the stems are crisp-tender. In short, a nutritionista’s dream! I have used vegetable broth for the liquid and estimated that you will have approximately 2 c of chopped greens. If you are watching your sodium intake, play with the amount of salt you use. The recipe serves 4 as part of a larger meal, and the figures given are per serving. It’s HOT in SoCal in September, but my thoughts are already turning toward soup and the (slightly) cooler weather of October (tomorrow! ), so here’s a perennial favorite that can be tweaked many ways. It is traditionally a pork-based soup, but this is a vegetarian or vegan version, depending on the stock you use. Five spice powder’s claim to fame is that it includes all 5 flavors found in Chinese cooking: sweet, sour, bitter, pungent, and salty. You can make your own by combining equal parts whole Sichuan (or other) peppercorn, cinnamon sticks, cloves, fennel seed, and star anise. The only one in the list that may be hard to find is Sichuan peppercorn – check your Asian market if you have one, or the Asian section of the international aisle in a conventional store. After toasting the spices lightly, grind in a mortar or with a coffee or spice grinder. If you’re in a hurry or don’t want to mess with that, five-spice is also available pre-mixed in Asian markets and in some conventional groceries – try the Asian section first, then the baking/spice aisle. In the meantime, combine the thickener ingredients in a small bowl. Stir the thickener into the liquid, return to a boil, reduce to a simmer, and cook, stirring fairly constantly, 1-2 m to cook out the starchy flavor. With the soup at a gentle simmer, add the eggs in a thin stream, stirring constantly. Add the vinegar and peppercorn, stir to combine. Adjust seasoning, garnish with sesame oil and scallions and serve. There are numerous ingredients you can add to make this a heartier soup. Add the ingredients to the liquid after step 2, and cook for 1 m.
For these calculations, I have used water in place of broth and just looked at the basic recipe (no added ingredients). You’ll see that for a fairly simple soup, it’s on the high end for both sodium and cholesterol – I have already reduced the salt and soy sauce amounts drastically, but you could try to tinker with that further, depending on whether you are watching your sodium intake or not. If you add some healthy vegetables, you could reduce the amount of egg you use and thereby lower the cholesterol count, but if you are making the original recipe, you’ll need the eggs to provide a bit of body to the soup. The recipe serves 4 generously as part of a larger meal, figures given per serving. This is probably not as popular as egg drop soup, wonton soup and hot and sour soup on the Chinese restaurant circuit, but you will find it offered in most restaurants. It is a very common homemade soup: simple, quick, and tasty, it is the perfect accompaniment or finish to a homecooked meal, particularly one that has some spice in it. You can also make it into a 1-dish meal by using it as a base for a bowl of noodles. The recipe is easily tweaked to become vegan by using water in place of the chicken broth. 1 qt chicken or vegetable broth (or water) – if you are using canned broth, be sure to buy the low-sodium variety and cut it with water 2 cups each or 1 c broth+3 c water. Separate the stalks of cabbage and soak them in cool water for 10 m, then drain, rinse, and repeat until no grit sinks to the bottom of the sink or bowl. Cut the cabbage stalks crosswise into 1″ wide ribbons. Cut the tofu into 1/2″ cubes, then soak them for at least 10 m in salt water (1 T salt to 2 c water) – this will keep them from falling apart. If you are concerned about sodium intake, you can omit this step, in which case be sure to not let the soup boil too rapidly and stir it GENTLY! Heat the oil in the wok over high heat until it shimmers, then add the cabbage ribbons and salt and stirfry quickly for 1 m.
Add the broth, bring to a boil, then immediately reduce to a simmer and cook gently for 4 m.
Drain and add the tofu, return to a simmer. Adjust seasoning with salt and serve. This recipe serves 4 as part of a larger meal – nutrition information is per serving. I have omitted soaking the tofu in salt water and used 1 c of low-sodium canned chicken broth + 3 c water for the liquid.